Jaromir Jagr of the New Jersey Devils listens to the national anthem just before his team faces off against the Toronto Maple Leafs at the Prudential Center in Newark, New Jersey, on Jan. 28. It’s not often that a player is still a desired commodity days after his 43rd birthday, but that’s precisely what Jaromir Jagr, who was traded from the New Jersey Devils to the Florida Panthers on Thursday, appears to be. Despite recent frustrations over his playing time with New Jersey, Jagr could prove to be a useful short-term rental for the Panthers. He retains the same soft hands and keen vision that made him a five-time scoring champion. And like so many of hockey’s greatest offensive talents before him, Jagr has a knack for skating where the action is headed before it arrives. His trademark strength seems scarcely to have waned with time; he still has moments when he’s nearly impossible to knock off the puck along the boards. Jagr is by no means the player he once was. But it’s improbable enough that he is still a player at all, still part of the league more than 24 years after his NHL debut. He had been 81 days older than the league’s second-oldest active player — St. Louis Blues goaltender Martin Brodeur — but then Brodeur up and retired last month. Now, no current player was born within 25 months of Jagr. 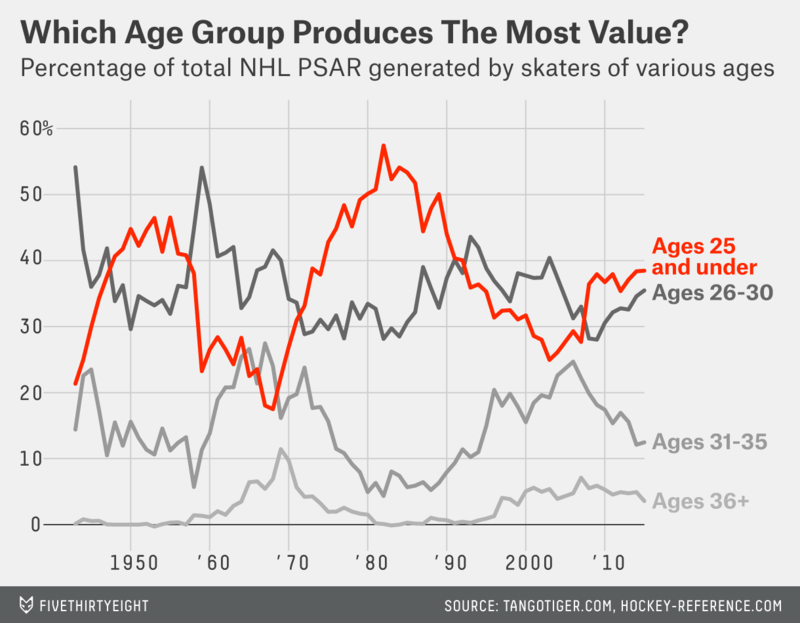 Of course, more than perhaps any major sports league, the NHL has had a place for ancient players. Three and a half decades ago, Gordie Howe — then the NHL’s all-time scoring leader — famously skated through a full 80-game schedule that concluded a week after his 52nd birthday. More recently, Chris Chelios was still manning an NHL blueline at age 48. And just last season, Teemu Selanne played at an age seven months older than Jagr is now. 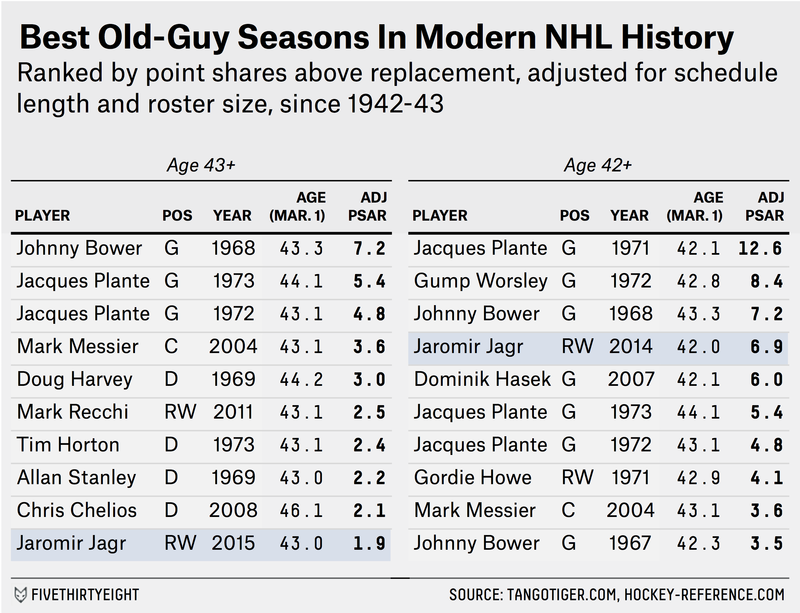 So it’s not quite unprecedented for Jagr to still be around at age 43 — and counting. But Jagr’s past few years have surpassed what just about any other NHL player has ever done in his dotage. Despite posting the leanest traditional numbers of his long career this year (more on that later), Jagr is1 in the midst of the seventh-best adjusted point shares above replacement (PSAR)2 season by any skater aged 43 or older3 since the NHL’s Original Six era began in 1942-43. What’s more, he was better last year: No non-goalie aged 42 or older has ever had more PSAR in a season than Jagr’s 6.9 in 2013-14. Plus, there’s a strong case to be made that the conventional stats — and the next-level metrics based off of them, such as PSAR — have undersold Jagr’s contributions to the Devils, particularly this season. As marvelous as they are for a player his age, Jagr’s basic numbers this year haven’t been eye-popping by the standards of other forwards logging as much ice time. In 53 games, he’s notched a modest 11 goals and 18 assists to go with a -10 plus-minus rating. (As a point of comparison, if Jagr had played to his career per-game averages, he’d already have 25 goals and 37 assists by now!) According to PSAR, which synthesizes box-score stats into a single-number representation of value, it’s been his worst season ever — and by no small margin. The 18-year-old rookie version of Jagr had 3.1 PSAR in 1990-91, after which he wouldn’t put up fewer than 4.9 PSAR in a single season again — until this year. Hockey’s recent statistical revolution, however, has brought with it more sophisticated ways to gauge a player’s contribution to his team. Its biggest lesson? That although goals and assists are great, there’s also a big advantage in simply helping your team keep possession of the puck. And as it so happens, Jagr is still one of the best players in the league at that. Over the past two seasons, Jagr’s Devils haven’t been an especially strong hockey club. They rank 24th in both point percentage4 and goal differential during that span, and while the team has undeniably been plagued by poor shooting and save percentage luck, they’ve also posted relatively unimpressive possession rates — except when Jagr is on the ice. With Jagr, New Jersey plays like one of the premier possession teams in hockey5; without him, they play like one of the worst. Studying Jagr’s game, it’s not hard to see why this is the case. Although his stride — never the fastest even in his prime — is noticeably sluggish these days, he makes up for it with sheer hockey sense, constantly scanning the ice for passing opportunities or chances to extend possession by corralling loose pucks. Perhaps more importantly, he remains the master of shielding the puck with his 6-foot-3-inch, 240-pound frame, creating scoring chances for himself and others by cycling possession deep within the offensive zone. This is why, with the NHL’s trade deadline approaching, Jagr was mentioned as a legitimate option for contending teams looking to upgrade their offense — particularly with the man advantage — before the playoffs begin. Ironically, it seems that as the league increases its emphasis on possession, Jagr’s value has only been heightened even as his goals and assists have receded with age. And for Florida, barely clinging to the hope of a playoff berth but with clear upgrades to be had on the power play and in advanced metrics, Jagr might be a good fit. On the other hand, what does it say about the state of the NHL in 2015 that a plodding 43-year-old future Hall of Famer could change a team’s postseason chances? It was undoubtedly an impressive run for Howe, but — counterintuitively — the ability of a man in his 40s (and even 50s) to still dominate a professional sports league might speak as much about the quality of play around him as to his own athletic gifts. In 1968-69 — the final year of the streak to which Orr referred — a 40-year-old Howe was nearly the best player in hockey, finishing second only to 26-year-old Phil Esposito in PSAR. And in his final season more than a decade later, Howe was serviceable enough to be a regular contributor. But the NHL of that era also underwent an enormous amount of upheaval between expansion, the emergence of a rival league (the World Hockey Association), and the influx of new talent (and a fresh playing style) from Europe. The 1960s saw the NHL’s first expansion since the Great Depression — marking the end of the Original Six era — and they also coincided with a major uptick in the production of older players, one that would not fully abate until the early 1980s. In addition to Howe, players such as Alex Delvecchio, John Bucyk, Jean Beliveau, Frank Mahovlich and Jean Ratelle all produced great seasons in their late 30s (and beyond). The present day also appears to be a haven for the comparatively superannuated. Starting in the early to mid-1990s, the fraction of league value produced by the oldest batch of NHL players swelled to levels not seen since the 1970s. While that proportion has decreased a bit today relative to its peak in the immediate aftermath of the NHL’s lost 2004-05 season, it remains higher now than at any point between 1974 and 1996. So Jagr’s longevity, impressive as it is, might also be a symptom of ongoing weaknesses in the state of pro hockey itself. Is it mere coincidence that the uptick began right when the NHL’s aggressive expansion plans of the 1990s were fully realized? Or that it lasted through the so-called Dead Puck Era and well into the post-lockout “New NHL“? It’s not clear. But regardless of where Jagr sits in the intersection between the NHL’s health and the twilight of his once-immense (and still formidable) skills, he remains a player to which attention is owed. The Panthers are picking up more than a living legend playing out the final act of his career — they’re nabbing a player who still offers many of the little advantages that could make a difference along the journey to the Stanley Cup. As of late last week. A modification of the Hockey-Reference.com metric that assigns goaltending worth according to Tom Tango’s wins above replacement and re-allocates the remaining value such that forwards receive 60 percent of league PSAR in a given season, defensemen get 30 percent and goaltenders receive 10 percent. As of March 1 of the season in question. In the wacky world of the NHL’s standings, some measure of sanity can still be salvaged by dividing a team’s standings points by the total number of points handed out in its games. So, for instance, the winner of a regulation game would earn 2 out of 2 total points; meanwhile, the winner of a shootout would get 2 out of the 3 total points awarded, since the loser would also get 1 point. Among other things, this has the advantage of preserving a .500 record as the mark of an average team. The Devils’ zone start-adjusted 5-on-5 Fenwick percentage with Jagr on the ice would rank third in the NHL over the past two seasons.